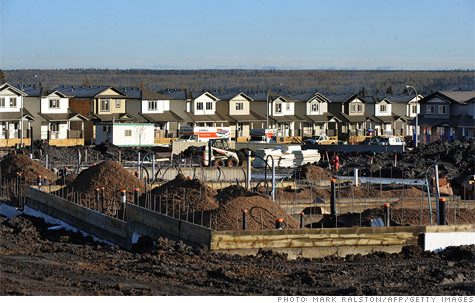 Is a housing shortage coming? NEW YORK (CNNMoney.com) -- As the nation struggles to shrug off the worst housing crash since the Great Depression, it may be hard to believe a housing shortage could be on its way. The nation is simply not building enough homes to keep up with potential demand. Just 672,000 new homes were started in April, an annualized rate and less than half the long-term run rate needed to meet the nation's natural population growth. "It is ironic, but there is a growing consensus that there may be a new housing shortage coming," said James Gaines, a real estate economist with Texas A&M. So far, the shortfall has been masked by a weak economy that has put a damper on home buying. Once the job market rebounds, however, people will look to have their own homes again. This pent-up demand could get unleashed on unprepared markets, causing shortages and rising local prices. In 2009, only 398,000 new households were formed, according to the Census Bureau. That is much lower than average and a quarter of the number formed just two years earlier. "The decline in household formation is artificial," said Gaines. "The young are moving in with their parents. There's even doubling up among working class people. There's a pent-up demand coming if and when the economy recovers." Those doubting a new bubble is near point to a large inventory overhang. As many as 7 million homes are vacant but not for sale, according to the Census Bureau, which should provide cushion to offset increased demand. "The housing market hasn't been this way before," said Nicolas Retsinas, director of Harvard's Joint Center for Housing Studies. "The gravity of the problem is deeper and the challenges different. You have to get through that inventory." The inventory number, however, can be deceiving for two reasons: People may not want to live in hard-hit areas where the houses are (think: California exurbs and Detroit neighborhoods) or the homes may be beyond repair. "Many of these vacant homes may not be habitable or are in locations where nobody wants to live," Gaines said. Ordinarily, the nation's homebuilders can react quickly to meet surges in demand. But several factors are preventing them from being nimble. The biggest is the difficulty getting loans, according to Jerry Howard, CEO of the National Association of Home Builders (NAHB). "When we came out of past recessions, there wasn't the difficulty of obtaining financing that there is now," he said. Many small builders have been unable to obtain construction loans or lost their financing in mid-project. That has prodded NAHB to support federal legislation that would make $15 billion in lending guarantees available for private builders. Hard times also persuaded builders to postpone purchases of land they could prep for future development. It will take them that much longer to gear up production once the housing market improves. Too, many builders went out of business in the bust, so there will be fewer companies out there to do the building. The survivors will confront a transformed regulatory environment, according to Howard, that will make new homes harder to build and more expensive. "There is an increased focus on smart growth that will create regulatory barriers to the kind of sprawling development that has characterized a lot of recent building," said Retsinas. The regulations come under two categories, according to Susan Asmus, NAHB's senior vice president for advocacy, covering where new homes are built and how they're built. One category is storm water runoff. The Environmental Protection Agency tightened requirement governing how builders handle that. Builders will have to install controls such as catchments or retaining ponds that slow the flow of storm runoff into the local watersheds. "It could add as much as $15,000 to $30,000 an acre in extra costs, depending on the soil," said Asmus. Another proposed regulation mandates sprinkler systems in each new home. This is already state law, starting January 2011, in California, Maryland and New Jersey. That adds as much as $10,000 to the cost of construction. Previous overbuilding one-time boom towns, such as Las Vegas and Miami, should provide enough inventory of like-new homes to counter any strong pent-up demand that breaks free. It's the more constrained markets, where it's particularly hard to build -- such as New York, San Francisco and Seattle -- that will field the bulk of the new bubble problems, according to Retsinas. He, however, is less worried about the purchase market than about rentals, the usual entree for the young buyers expected to lead the new housing market charge. "Nobody is building any rental inventory," said Retsinas.